Dimensions: 2 1/4" x 3 1/2"
This fantastic deck of playing cards comes with personalized stickers (for the case only, not the cards) in your choice of numerous floral garden design/color combinations and two lines of custom text or your initial(s) (in the pictured fonts only). Choose from a wide variety of creative designs for any theme as well as an array of color options. 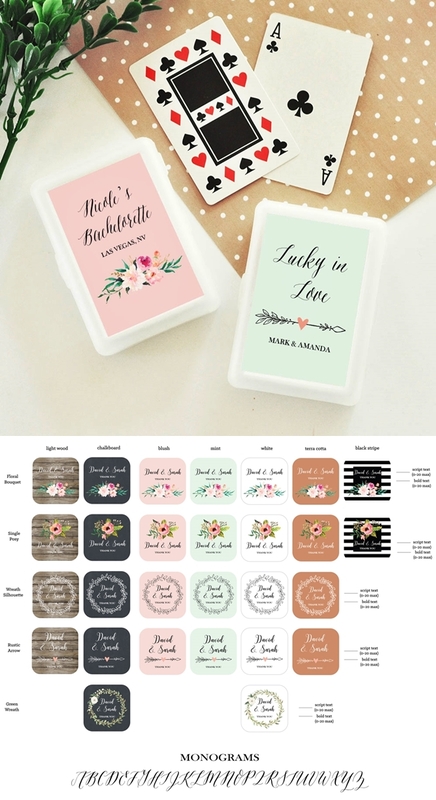 You also get to add names and a date, and or a custom two line message to your labels to remind your guests of your big day with every hand they play. PLEASE NOTE: Only the stickers that go on the outside of the case are personalized; the cards themselves are not personalized. Personalized labels will arrive unattached to the cases so some assembly is required. Due to personalization, the minimum order quantity is 24.